It’s off to work we go! 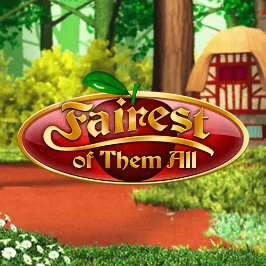 Ash Gaming have secured the license to reimagine the classic tale of Snow White and the Seven Dwarves, and this – Fairest of Them All – is the fruit of their labour. The beautiful Snow White is perhaps a little too fond of apples – once again she has taken a bite of poisoned fruit from the Evil Queen. Your mission as Prince Charming is to awaken her from her slumber with the help of the seven dwarves: Sneezy, Bashful, Dopey, Trigger, Dave and the rest of the gang. This slot title features a pair of lucrative bonus rounds as well as a progressive jackpot, meaning the riches on offer are very rewarding indeed. The standard five reels and 20 paylines sit neatly on a gameboard set in the enchanted forest, with many magical creatures making an appearance. You can expect a variety of characters to appear on the reels, including the Evil Queen, Prince Charming, Snow White, the poisoned apple, a sinister glass coffin, and more. These all pay on an ascending scale for matching three or more from left to right on an active payline. In addition, you'll find there's a trio of bonus symbols to watch out for. The game’s logo is wild and will create wins on your reels by substituting for all other symbols (apart from the two bonus icons) to make up new winning combos. The bonus symbols (the Dwarf and the Free Spins) trigger the game’s most exciting features. Gold Dust – winning symbols turned into a more valuable set. Given their vertically-challenged nature, you’ll have to keep your eyes peeled for the Dwarf bonus symbol, but will be thoroughly glad you did. If you can reveal three of this little chappy across reels one, three and five, you will trigger the Mine bonus feature. This is the standard ‘pick ‘em’ style game set down a mineshaft, with each dwarf you reveal adding to your prize fund. When you land the ‘collect’ symbol, the bonus is over. 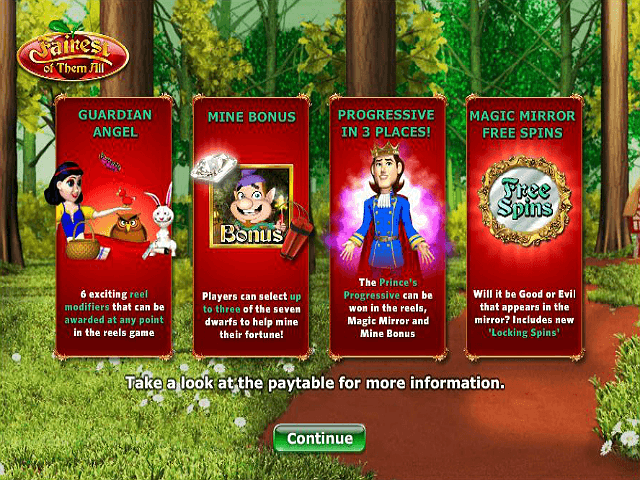 There is a Free Spins feature in Fairest of Them All, too. To trigger this, reveal three of the freebies icon on reels two, three and five, and you will start with five free ones. This tally can actually grow; Snow White appearing in the mirror will see your total increase by one each time, whereas the Evil Queen will reset your count to zero. 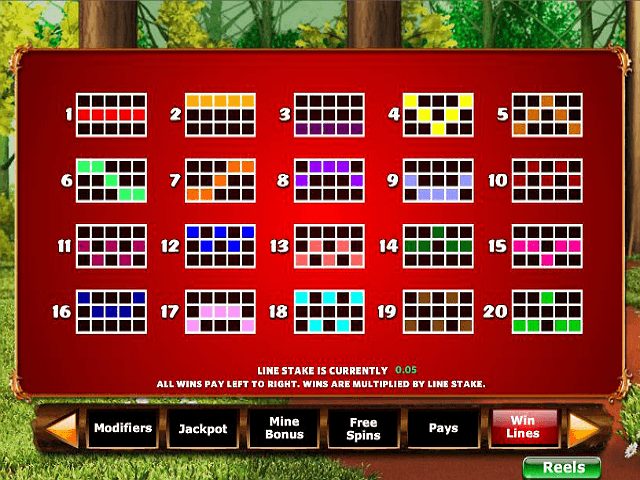 A quick note about the progressive jackpot available here: there are three ways to trigger it. The first of these is if Snow White summons the Prince during the main game, the second, if the Prince randomly appears in the Mine bonus round, and third, if the Prince appears in the mirror during free spins. 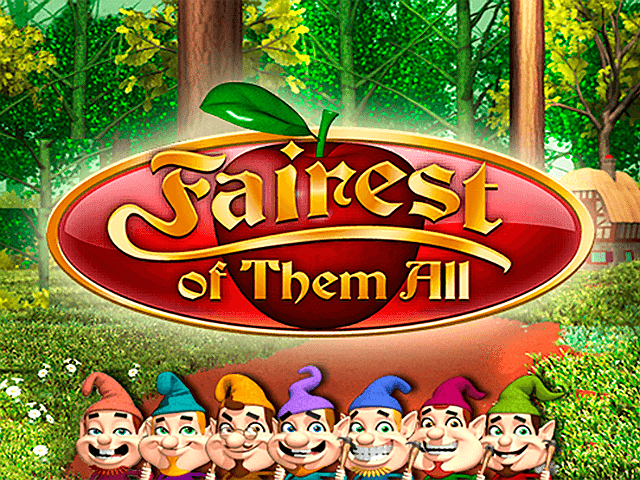 If you're looking for a game that delivers as much narrative as it does wins, look no further than the Fairest of Them All online slot. 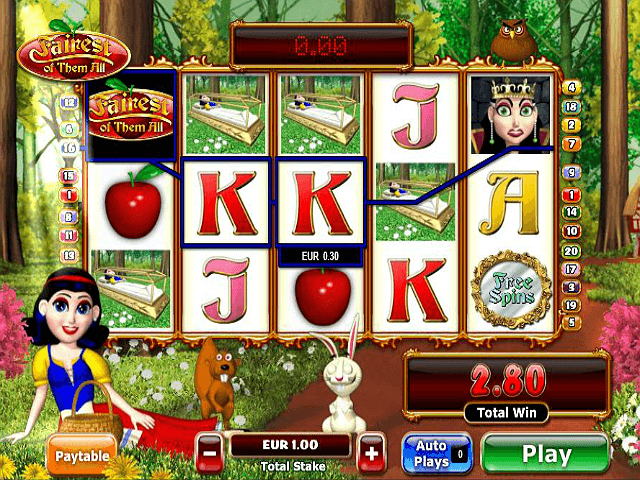 If you like Fairest of them All - You'll like these slots too!